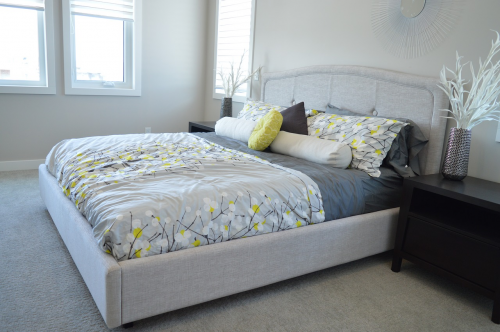 Aside from the right temperature and a clutter-free bedroom, a bed with the right firmness is a great factor in making sure you wake up refreshed and revitalized. Now the question is, should you get a plush or a firm bed to get quality sleep? What is the difference between the two? In this article, we will explore the many differences between a plush and a firm mattress. A plush mattress is a type of mattress that has a soft surface that gives you extra cushioning. Its firmness level is 6/10 or medium, between the firm and pillow top mattresses. A high-quality plush mattress typically has a latex core, which adds to its softness and flexibility. Another layer of soft foam is added on top of the frame that contains the springs. A permanent cover is then sewn to cover the whole mattress to protect the foam from wear and tear. Plush mattresses are great for those who sleep on their sides or back. They offer enough “give” to accommodate the curves of your body without giving you that sinking feeling. However, if you sleep on your stomach on a plush mattress, the middle part of your body may sink, which may cause back pains during the day. On the other hand, a firm mattress is a type of mattress that has a firm surface because it has no extra cushion. Its comfort or firmness level is 7.5. Firm mattresses are constructed using tightly embroidered layers to achieve that solid feel. They are great for those who like to sleep on their stomachs or those who are used to sleeping on hard surfaces. If you lie on a firm mattress on your stomach, the middle part of your body will not sink into the mattress, thus the natural form of your spine is maintained. A firm mattress is also great for those who have problems with their backs because it pushes the spine upwards because it basically has no “give” at all. What, then, is the difference between a plush and a firm mattress? The difference between the two is that a plush mattress is significantly softer than a firm mattress. With a firmness level of 6, a plush mattress has a softer surface which offers more “give” when you lie on it. A firm mattress, on the other hand, has a firmness level of 7.5, which means it does not offer much “give” at all. Plush mattresses are great for those who sleep on their back or sides. They offer enough “give” to adapt to the shape of your body while still giving your whole body enough support. Firm mattresses are great for those who sleep on their stomachs or back because they are hard enough to prevent spine misalignment while lying down.